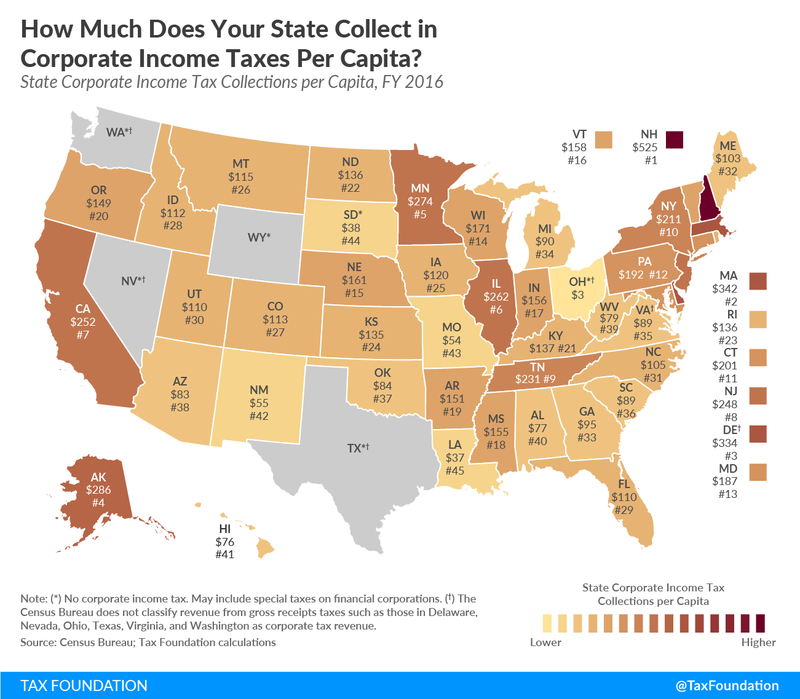 Today’s map shows state corporate income tax collections per capita in the fifty states. Collections are highest in New Hampshire at $525 per capita and Massachusetts at $342 per capita. Delaware comes next, collecting $334 per capita in corporate income taxes and levying an economically harmful gross receipts tax. Six states—Nevada, Ohio, South Dakota, Texas, Washington, and Wyoming—do not levy a corporate income tax, but four of the six (Nevada, Ohio, Texas, and Washington) levy a gross receipts tax. In some states without a corporate income tax, a small amount of corporate income tax collections per capita may be shown due to taxes on specific types of businesses, such as financial institutions, which are sometimes structured as corporations. Compared to other sources of tax revenue—such as income, sales, and property taxes—states rely relatively little on corporate income taxes. According to the U.S. Census Bureau, in fiscal year 2015, the corporate income tax generated only 5.3 percent of total state tax collections. One reason for low reliance on corporate income taxes is that many businesses have shifted away from the traditional C corporation structure and are instead structured as pass-throughs, which pay income taxes using the individual income tax system. For those businesses that are subject to the corporate income tax, it is one of many taxes they pay. In fiscal year 2016, corporate income taxes accounted for only 14.9 percent of all taxes paid by businesses to state governments. Sales, property, unemployment insurance, excise, and payroll taxes are among the other taxes paid by pass-throughs and corporations.